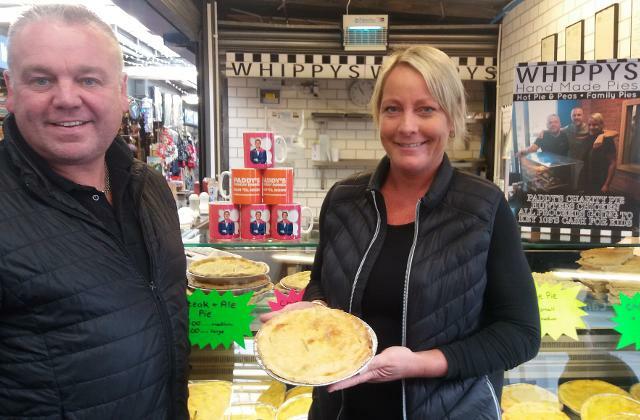 Pie lovers should head for Bury Market where a special delicacy has been whipped up to raise money for local charities. Whippy's Pies have teamed up with Key 103's Paddy McGuiness to create a 'Paddy Pie' which will be sold on the stall to raise funds for Key 103's charity Cash For Kids*. The pie, which has been tasted and approved live on air by Paddy himself, is a hunter's chicken pie with chicken, ham, barbecue sauce, and topped with cheese. The Paddy Pies go on sale today (Wed 26 Oct) at Whippy's Pies, which is on Margaret Block (12 and 13) on the market. They cost £4 each, and everyone who buys a pie will receive a free Key103 mug. Peter Whipp, the pie's creator, said: "Since starting on Bury Market I have always been keen to support charities in our community, and thought that this would be a good way of raising funds for a worthy cause and having a bit of fun creating a new pie to complement the perennial favourites on the stall." Stocks are limited, so if you want to sample this culinary delight you need to hurry down to Bury Market on Wednesdays, Fridays or Saturdays. Pictured: The pies have it! Bury Market stallholders Peter Whipp and Emma Scott with one of his specially created fund-raising Paddy Pies. *Cash for Kids responds to the needs of children in our communities so they can live life to the full and realise their individual potential. We raised £18.1 million in 2015.